Stay in the loop. Subscribe for updates and new post notifications. 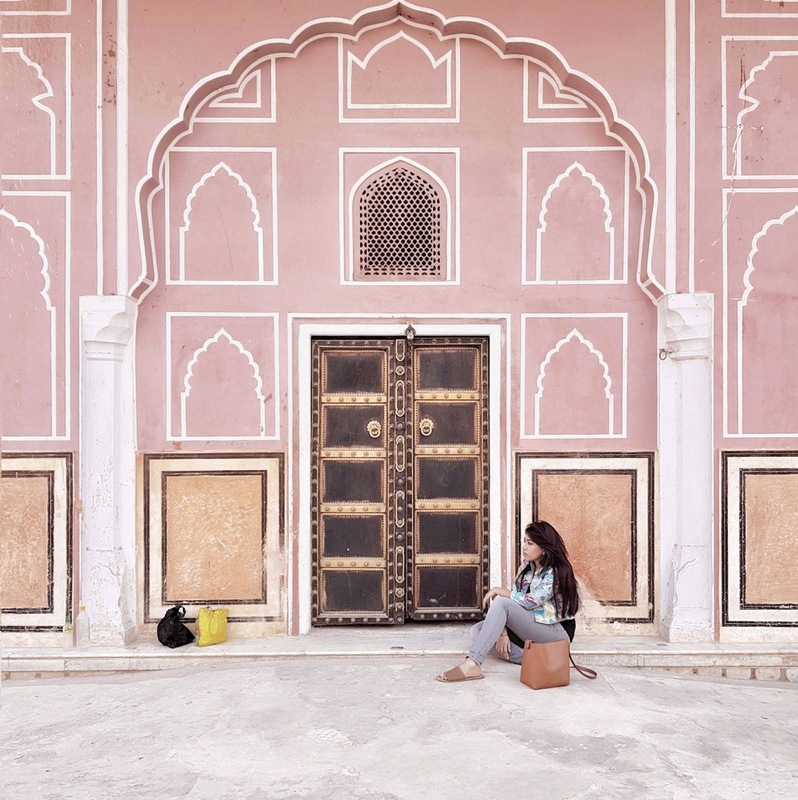 The country’s first planned city, Jaipur earned the moniker Pink City when Maharaja Ram Singh painted the entire city pink in honour of the Prince of Wales’s visit to India in 1876, for the colour pink symbolised hospitality. One corner of India’s golden triangle, Delhi – Agra – Jaipur, Rajasthan’s capital is an enchanting city, bustling with modernity and yet steeped in tradition and history, that you feel it in the very air you breathe. Here is a lowdown on how to spend 24 hours in Pink City, the old city of Jaipur. Start your day like a local! Dig into the hot, savoury Pyaaz Kachoris and Jalebi at the iconic Lakshmi Mishthan Bhandar, lovingly called LMB, while you wait for the “World Famous Paneer Ghevar” to be packed for you to take back home. This vegetarian restaurant in the old part of Jaipur, the Pink City as it is known, has been going strong since 1954. & If you are not up to breakfast then the Rajasthani Thali is surely a must try. For when you are in Jaipur, you cannot not have the ghee laden Daal Baati Churma atleast once. Hawa Mahal is a paradox. It is at once Jaipur’s – or even Rajasthan’s – most iconic monument and it is also probably its most underrated. For everyone’s visit to this beauty in pink begins and ends with a picture outside it. But you really enjoy it and begin to appreciate its name, Hawa Mahal, the Palace of Winds only once you are on the inside. Johari Bazaar, or jewellers bazaar is Jaipur’s most popular shopping street. From silver trinkets to exquisite jewellery set in kundans, precious gems and diamonds, it truly is an experience, even if it is just to take a look at designs that hark back to a regal era. Lunch like a royal at Rajput Room, an all day fine dining restaurant in the Taj Rambagh Palace. The erstwhile palace of the celebrated beauty, Maharani Gayatri Devi, queen of Jaipur, the Rambagh Palace is everything that India is associated with. A palace of marble elephants, Mughal gardens, hand-carved marble jalis (latticework), sandstone balustrades and chattris. The City Palace and the Jantar Mantar, both in the old walled city (Pink City) of Jaipur, located one opposite the other were built by the founder of Jaipur, Maharaja Sawai Jai Singh II. The city palace is a striking complex of colours, doors and paintings on the wall. Within the palace are the Mubarak Mahal or the erstwhile palace of reception which is now the Maharaja Sawai Man Singh II Museum showcasing unique royal costumes with the traditional Sanganeri prints and folk embroidery. A section of the palace is still home to the last ruling royal family, while another section houses a restaurant, only lately opened. Jantar Mantar a UNESCO World Heritage Site, is the largest of the five astronomical observatories built by the Maharaja. A beautiful garden that houses sixteen intricate and extensive geometric devices built in brick and mortar were designed to measure time, track celestial bodies, observe the orbits of the planets. & Even one dedicated to the twelve zodiac signs. The Royal Heritage Haveli has to be my favourite-st hotel ever and I will probably go back to Jaipur just to stay here again. Still owned by Maharaja Jai Singh of Jaipur, this 18th century hunting lodge is today a quiet boutique hotel that sure is a ‘tranquil haven of space and luxury to the discerning few’ as they like to call it themselves. & a candle light dinner under the sprawling tree in the courtyard is just the right bit of romantic. The stunning Amer Fort, sitting atop a hillock and reached by a road traversed not just by your everyday vehicles but also by hundreds of elephants (if that’s your style) is Jaipur’s star attraction. Along the road up to Amer Fort, stop by at the Panna Meena ka Kund, a small but beautiful eight storeyed step well, complete with the quintessential Rajasthani chhatris at its four corners. Set up to showcase and sensitise visitors to art of traditional hand block printing on fabrics, the Anokhi Museum of Hand Printing housed in a restored haveli under the shadow of the Amer Fort has been making it to the must-visit list of the discerning traveller interested in understanding the artisanal heritage of a place. I had shot this years ago on a small Sony Cybershot, while on a holiday there with my parents. The Nahargarh Fort is famous for its sunset views of the city and the two kilometre trek to the top along with the restaurants here are quite the favourite with locals, come an evening. Uber is the most convenient way of getting around the city. Book it on Uber Hire and you can get around in comfort and still not burn a hole in your pocket. Save on the ride, splurge on the stay! Now that I missed dining at LMB, everyone’s speaking about it. 😄 May be it was meant to be..so you have a reason to visit Jaipur again! Its really amazing to go through this post which contains so many details with beautiful photography,among all Jantar Mantar attracts me lot. Thank you so much. Kind words indeed. ☺️ Jantar Mantar is fun! Love the pictures! A great guide for those visiting the city! Very beautiful pictures and very well written. An exciting 24 hours!My favorite places on my visit there were the Hawa Mahal and the Jantar Mantar. The Jantar Mantar in Jaipur is really beautiful and reading the information from the inscriptions there literally serves as a masterclass in ancient Hindu astronomy. Keep exploring and sharing!